"By March 2013, rising asset values succeeded in filling the $12.5 trillion hole in households’ net worth that developed in 2008. Quantitative easing appears to have played a major role in spurring that recovery. As in the period leading up to the recession, some think this rapid increase in household net worth is a clear sign that monetary ease is producing asset inflation rather than price inflation. But, unlike the previous period, the distribution of these gains primarily benefits upper and upper-middle income households. The largest increases were in their holdings of corporate stocks, mutual fund shares and pension funds, while growth in the values of residential real estate and households’ equity in non-corporate (small) businesses remains below pre-recession levels. Thus, what seems a resurgence of the potential for the so-called “wealth effect” to increase confidence and stimulate demand may be undermined by the further boost this uneven appreciation in asset values gives to inequality. The benefits of the rise in households’ net worth are far weaker than in the past because there is no clear connection to employment. In addition, the fact that inflated capital market assets held in pension funds are not easily used to back new borrowing may have limited the effect on spending." PS: On a related topic, the negative effect that higher bond prices might have on income distribution and the level of activity, see Tom Palley here. Should the AER retract Reinhart and Rogoff's paper? The case of Dutch social psychologist Diederik Stapel fraud, now in the news, which led to the retraction of several of his papers by academic journals suggests that this might be the right course of action for the American Economic Review (AER). Even if Reinhart and Rogoff's (RR) results do not necessarily amount to fraud, something that I'm sure could become a matter of dispute, it's still a fact that they are incorrect, as admitted by the authors. So the AER should clear the record and retract the paper that suggests that growth collapses when a country has a debt-to-GDP ratio of more than 90%. PS: As the NYTimes notes there is a blog about scientific papers that are retracted here. The blog dealt with RR case here. The Economist has posted a chart with some evidence of falling commodity prices, noting that since last September their index has fallen by 12%. The most discussed fall in recent times had been that of Gold, but others are relevant too. Note that this masks significant variation in commodity price dynamics. For example, soybean prices fell from US$ 615 in August to 536 last March. Still high by historical standards, but considerably lower. The same is true for copper, with a fall from US$ 8,087 last September to 7,652 in March. Natural gas, on the other hand, went from around US$ 70 in March 2012 to about 136 last March, which is not the highest from a long term perspective. This suggests that commodity producers will be hit very unevenly by variations in prices, as will importers. PS: All data available here. From a policy point of view, in the United States, the two common periods associated with the ascendancy of Keynesianism are right after the so-called Roosevelt recession in 1937-38, when Currie and Eccles and other fiscal expansionists got the upper hand in the dispute with Morgenthau and the deficit hawks, and the Kennedy-Johnson tax cut in 1964, when the New Economics became dominant in the Council of Economic Advisors (CEA), during Walter Heller's chairmanship, when James Tobin (among others) was a staff member. And it is correct that in both periods expansionary fiscal policies, which are broadly Keynesian, were actually pursued. But it would be a mistake to think that Keynesian ideas actually won the day, and became common sense among policy makers and the political elites in the US. In fact, while Keynesian ideas and Keynesian economists became dominant for short periods, for the most part political elites remained firmly conventional and remained wedded to sound finance ideas. Without World War II and then the Cold War, which allowed for some type of Military Keynesianism, Keynesian ideas would not have had a chance. In theory too, while Keynesian ideas associated to the possibility of unemployment in the short run became dominant, the reason was not Keynes' own explanation that this would be the normal, long term situation, associated even to a situation with wage and price flexibility. Unemployment was seen as an imperfection, something that required in the short run a brief stimulus, but that did not have significant long term effect. Hence, by the 1950s if small deficits in recessions or war periods would be acceptable for politicians, they were certainly not seen as desirable as a longer term instrument for economic development. Domar, Lerner and other Functional Finance authors, that took Keynes' fiscal ideas to their logical conclusion never became dominant. In a sense, we can say that we were never truly Keynesian. Only by the 1970s a sort of perverse Keynesianism would eventually prevail within one of the wings of the Republican Party. Supply-siders would argue that lower taxes, not as a result of its multiplier effects, but as a result of the incentives to invest, would lead to higher growth, hence deficits were not a problem. This was embraced by some more mainstream Republicans also, as a way of promoting the 'Starve the Beast' strategy, i.e. cut taxes in a boom, and force welfare cuts in a crisis (any similarity with current events is totally not a coincidence). On the other hand, most Democrats, which were never particularly Keynesian, moved away even from a short term defense of anti-cyclical fiscal policy. For that reason we should not be surprised that austerity, and sound finance ideas have gained so much traction in recent debates about the Great Recession, and why we should continue to have a very slow recovery. PS: The significant victory of Keynesians was less about the consensus on anti-cyclical fiscal policy than the implementation of programs that established automatic stabilizers, like unemployment insurance. PS2: Krugman today says that the austerian's position has imploded with the Rogoff-Reinhart debacle. Also, he shows that most Americans actually are not concerned about deficits, but the wealthy are. I guess politicians respond to the wealthy then. Like in gun control, what the majority wants does not necessarily translate into policy. 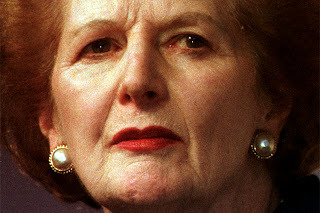 "The cry of “loss of confidence” is largely a smokescreen let loose by certain conservatives who are traditionally opposed to almost any Government expenditure, who object to any increase in taxes, and are too shortsighted to know that the perpetuation of the present level of unemployment constitutes de most dangerous threat to their own interests ... The statement that the bond market could not absorb Government bonds has been made ever since the first unbalanced budget, yet today Government bond prices in the United States are higher than ever. ... If [companies] do not employ the potential purchasing power [of the unemployed], the Government can do so at virtually no expense to the community." Of course several would dismiss White as a commie spy, even though the best evidence is that we do not know if he was a spy at all. But it's easier to blacklist Keynesians as commies than to deal with their arguments. More on the Reinhart and Rogoff debacle. It says a lot about the state of mainstream economics. I linked to Eatwell's lecture in honor to Garegnani at the University of Rome. The text has been published in Contributions to Political Economy (full text here, subscription required). It is important to note how central Garegnani's PhD dissertation was for his following work. "Key elements in the life's work of Pierangelo Garegnani (9th August 1930–14th October 2011) derive from the analytical results first developed in his 1958 PhD dissertation at Cambridge University. The critique of Walras's theory of capital articulated in the dissertation was extended in later years to the identification of the implications of the change in the concept of equilibrium in the works of Hicks and Debreu." "First, he specified the problem clearly: the determination of natural/normal prices, i.e. the solution to the problem of value and distribution. Secondly, he clarified the structure of the competing theories, classical and neoclassical, by defining the data of the theory, i.e. the propositions taken as given. In the case of classical theory these were the social product (its size and composition) the technique or techniques of reproduction and (sometimes) the real wage. In the case of neoclassical theory the data were preferences, endowments, and the technology (constrained to constant returns to scale by the requirements of perfect competition). 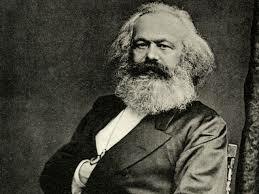 Thirdly, he defined the analytical problems faced within each theoretical construct in terms of measurement: in classical theory measurement of the social product independently of its distribution; in neoclassical theory the measurement of the endowment of reproducible means of production in a manner compatible with the determination of normal prices, i.e. with a uniform rate of profit on all capital goods." 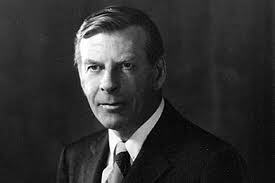 The limits of the mainstream approach, and the open possibilities of the alternative classical-Keynesian approach can still be derived from his seminal work. A brief follow up on the post on Baumol's Disease and healthcare costs. It's obvious that something else is also going on in the US, since the costs are much higher than in other countries with similar results. Graph below show spending on health as a share of GDP and life expectancy in 4 countries. Note that the US spending almost 7% of GDP more than the next, and does not do better as a result. A broader public healthcare system as in the other 3 is part of the explanation. 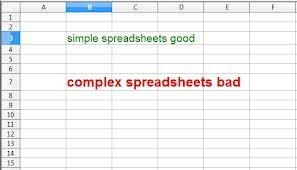 Data comes from Index Mundi. Does High Public Debt Consistently Stifle Economic Growth? The journal Estudios Críticos del Desarrollo has a new issue (in Spanish) on Raúl Prebisch. Below the abstract for the paper co-authored with Esteban Pérez Caldentey on Prebisch and Keynes. Keynes had a profound influence on Prebisch, not only in terms of his diagnosis of the main failures of market economies, but also on the need to pursue pro–active and anti–cyclical policies. 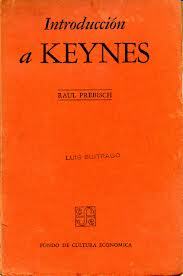 However, Prebisch was critical of Keynes’ most important publication, The General Theory of Employment, Interest and Money (1936). He viewed this work as being removed from the reality of capitalist economies. He also argued that it was inconsistent and did not represent at all a break with conventional wisdom. Prebisch’s criticisms focused on the theory of interest and the multiplier. Prebisch’s attitude in relation to Keynes can be explained by a difference in the object and method of analysis. The former’s interests focused on dynamics and cycles, themes that were peripheral to the central message and analysis of The General Theory. Notwithstanding Prebisch’s criticisms, there are several similarities between his analysis and that of Keynes. This paper argues the euro zone crisis is the product of a toxic neoliberal economic policy cocktail. 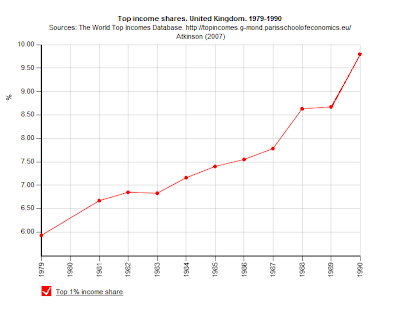 The mixing of that cocktail traces all the way back to the early 1980s when Europe embraced the neoliberal economic model that undermined the income and demand generation process via wage stagnation and widened income inequality. Stagnation was serially postponed by a number of developments, including the stimulus from German re-unification and the low interest rate convergence produced by creation of the euro. The latter prompted a ten year credit and asset price bubble that created fictitious prosperity. Postponing stagnation in this fashion has had costs because it worsened the ultimate stagnation by creating large build-ups of debt. Additionally, the creation of the euro ensconced a flawed monetary system that fosters public debt crisis and the political economy of fiscal austerity. Lastly, during this period of postponement, Germany sought to avoid stagnation via export-led growth based on wage repression. That has created an internal balance of payments problem within the euro zone that is a further impediment to resolving the crisis. There is a way out of the crisis. It requires replacing the neoliberal economic model with a structural Keynesian model; remaking the European Central Bank so that it acts as government banker; having Germany replace its export-led growth wage suppression model with a domestic demand-led growth model; and creating a pan-European model of wage and fiscal policy coordination that blocks race to the bottom tendencies within Europe. Countries, particularly Germany, can implement some of this agenda on their own. However, much of the agenda must be implemented collectively, which makes change enormously difficult. Moreover, the war of ideas in favor of such reforms has yet to be won. Consequently, both politics and the ruling intellectual climate make success unlikely and augur a troubled future. Since the classic work by William Baumol (Baumol and Bowen, Performing Arts: The Economic Dilemma, 1965), serious doubts have been raised about the possibility for services to lead to significant increases in productivity. Baumol and Bowen argued that “the output per man-hour of the violinist playing a Schubert quartet in a standard concert hall is relatively fixed, and it is fairly difficult to reduce the number of actors necessary for a performance of Henry IV, Part I” (1965, p. 500). That should not be confused, obviously, with lack of productivity in the service sector as a whole, but it should be noted that the quality of the services often improves as a result of higher productivity in manufacturing. For example, improvements in the phonographic, cinematographic, electronic, and telecommunications industries imply that more people have access to Schubert’s quartets and Shakespeare’s plays at lower cost. While the cost of downloading a digital version of Schubert's quartets might be incredibly low, the relative costs of maintaining a full orchestra tend to increase over time, since musicians must be paid. Note that the problem is not that musicians are paid too much (they aren't believe me), but that their wages tend to grow more or less together with the wages of other workers. That means that the relative costs of orchestras, that cannot reduce the number of musicians per presentation, when compared to car producers, that can reduce the numbers of workers per car produced, must grow over time. The same is true for other services that cannot reduce substantially the number of workers per unit produced without affecting the quality of the product, like education and healthcare. Baumol's new book deals with the effects of the eponymous disease on healthcare, and suggests that there is no problem in spending more on health. Worth reading. To anyone familiar with basic balance of payments accounting, it will come as no surprise that income from foreign investments are included under current account transactions. To students learning balance of payments accounting however, this can be quite confusing. Why should the foreign investment be considered part of the financial account, but the income from the investment be included in the current account? After all, a capital gain or loss will be recorded in the financial account, why not interest and dividend income? The typical answer provided in most textbooks is that the supply of capital can be thought of as the provision of a service (a very contentious proposition in the history of economic thought one might add!). But if “supplying capital” is a service, why is not included in services? Payer is referring here to the well known “asymmetry” in the regulation of current and capital transactions as written into the IMF Articles of Agreement. While there are options available for countries to place controls on capital, “no member shall, without the approval of the Fund, impose restrictions on the making of payments and transfers for current international transactions” (Article VII, section 2). This reflects the view that the control of capital was central to the maintenance of international economic stability, a view held by both Keynes and White at Bretton Woods. Since then of course, the IMF has made attempts to resolve this asymmetry by encouraging countries to not exercise controls on the movement of capital (recent changes in tone aside). The richest 300 people on earth have the same wealth as the poorest 3 billion. This is no accident. Graph above shows the fall in unionization rates and the share of wages in total income. The former fell around 10%, from around 50% of the labor force to below 40%, while the latter fell 5% or so. Higher unemployment, no negotiation with unions, lower taxes for the wealthy (marginal income tax rates) and higher for the poor (higher Value Added Tax, VAT), all combined to bring labor into line (end its veto power). That's her legacy. The rest is confusion, or worse just concealing the truth. PS: A more critical perspective from Krugman here. How bad is the job market? 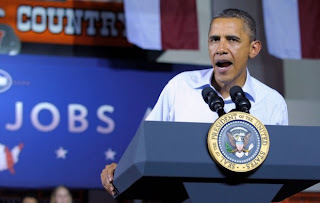 The numbers for the job market last Friday were not particularly good, with only 88,000 new jobs added. Note, however, that the average job creation in the current recovery is not very different from the Bush one (see graph below). Note that, while the last recession was more severe, with a drop in jobs of 800,000 at some point (against slightly more than 200,000 in the last one), the recovery has been adding a bit less than 200,000 on average (not very different than the previous one). So unless there is more fiscal stimulus (which is very unlikely, to say the least) this recovery will also be slower than the previous (since the hole was deeper). Within the vast literature on the sociology of development, it has been theorized that recent reorganizations of capitalist development, specifically concerning a ‘new international division of labor,’ have reconstituted the global social cartography. What are the contours? & how should the be measured? These questions are difficult, especially given that ever-increasing cross-border linkages and exchanges-a time-space compression, so to speak-, seemingly represent a juggernaut for countries to achieve socially equitable economic path-dependencies. 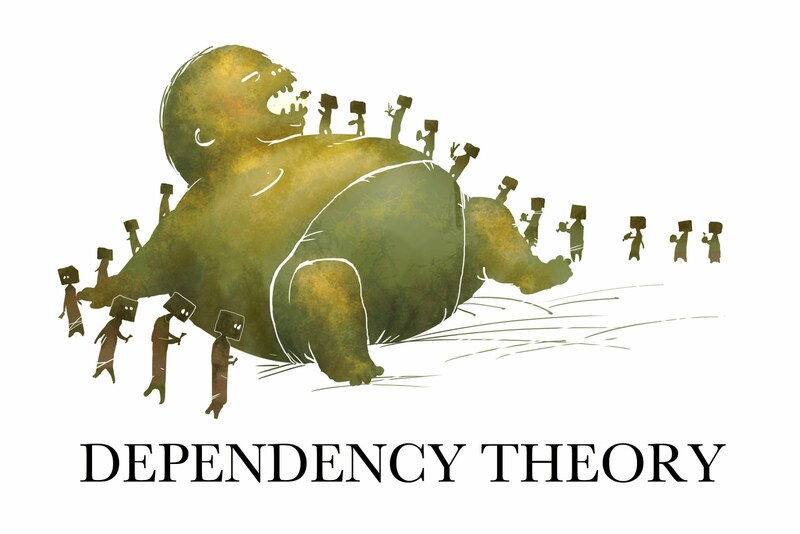 Given the dynamic connective relationships of complex interdependency, specifically concerning the proliferation of financial capital mobility and the aggrandizement of transnational corporations (TNC’s), the capability for the developing world to achieve, to some degree, relative mobility that transcends the center-periphery divide is perceived to be implausible. As such, global capitalism proliferates ‘third worldization’ through the constant oppressive force of ‘primitive-accumulation', what Myrdal (1957) defined as international ‘backwash’ effects. Hence, the capitalist world economy is reproduced as a world-system (Wallerstein, 1979) of ‘unequal exchange’ (Emmanuel, 1972), in which ‘underdevelopment’ (Frank, 1969), namely, the inability to generate complex domestic patterns of effective demand, ensues peripheral long-run stagnation and monopoly rents, or competitive advantages, for the center; in the final instance, the terms of trade for the periphery fall precipitously - the Prebisch-Singer hypothesis. Per Cardoso and Faletto ( 1970), however, development in the periphery is possible if foreign capital creates spillover effects. 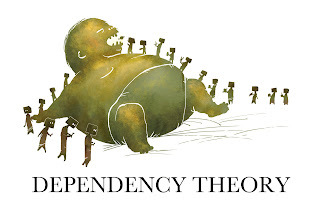 Partial economic growth is viable through what Evans (1995) describes as ’dependent development’, in which there is a relatively strong tripartite relationship between the state, the local bourgeoisie, and foreing capital - an ‘embedded autonomy’ (Evans, 2002). Whether or not this is manifested is the extent to which, as Vernengo (2006) argues, a country does not suffer the inability to borrow in its own currency, especially in which the world economy is structured by the globalization of financial liberalization. For more on the topic see here. deficits cause higher interest rates (the current situation makes the rebuttal to this clear). Yet those arguments are still trotted out. Are you concerned with unemployment and the effects of austerity on the very slow recovery? The Congressional Budget Office (CBO), with the help of mainstream theory, has a solution. 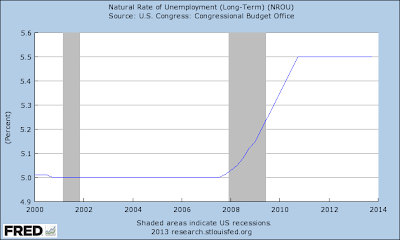 Just hike the natural rate of unemployment. 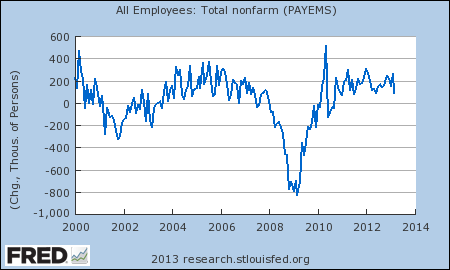 Now there are less people involuntarily unemployed, and we are only about 2.2% above 'full employment.' If they hike it a bit more we are done, and John Taylor and Martin Feldstein will be correct in pressing the Fed to hike the rate of interest. It is a convenient solution no doubt. 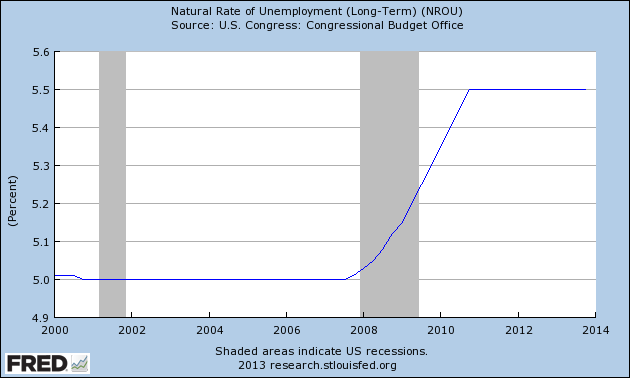 Mind you the most typical way of deriving the natural rate is from some kind of average of the actual unemployment. In other words, they [mainstream] tell you that the average of a series is the attractor of the actual series. Talk about having things upside down! This reminds me of the time Bob Solow gave a talk at the New School (in 2001) and suggested at the beginning that the idea of the natural rate was incorrect and should be avoided. By the end of the talk he argued that most analysts think that the natural rate was, back then, at around 5.2%. There it is, the natural rate doesn't exist, but it is 5.2%. A new paper by Isabel Ortiz and Matthew Cummins shows that austerity after 2010 has been more or less a general feature of the world economy, and not restricted to developed countries as one might think. The table below shows the changes in government spending in 2010-12 with respect to 2008-9. As it can be seen, 56 of the 132 developing countries have moved to a contractionary fiscal stance. Note also that the contraction in spending is higher in developing countries than for high income countries. Too much austerity too soon, on a global scale. We have discussed the role of property rights in the process of development. The recent Indian case is one in which a broader definition of property rights, one which may be seen by some conservative economists as a violation of patents held by corporations, may actually help the process of development. "The ruling by the Supreme Court of India dismissing the petition from Novartis AG is a historic decision with positive global implications ... The Novartis AG application had claimed a patent for a new salt form (imatinib mesylate), a medicine for the treatment of chronic myeloid leukemia. Novartis sells this medicine in several countries under the brand name Glivec (Gleevec). The Indian patent office had rejected the patent application on the ground that the claimed new form was anticipated in a US patent of 1996 for the compound imatinib and that the new form did not enhance the therapeutic efficacy of the drug. The decision was upheld by the Indian Patents Appellate Board (IPAB). The decision by the Supreme Court of India has significant positive global implications. It has effectively protected the leading role of India in supplying affordable medicines to other developing countries. The reaffirmation of the primacy of health and access to medicines as a right of citizens is particularly important for the international community when these rights are under significant threat under bilateral trade and investment agreements." Just posted on Blanchard and the role of the IMF in understanding and acting on what it learned after the crisis. I was reminded of that great documentary Inside Job. And there lies the problem. Institutions are in place to maintain the 'right' kind of learning. Olivier Blanchard has again posted on the lessons from the crisis, and one has reasons to be underwhelmed again (his previous attempt is discussed here). The general tone is the same as before, we don't know enough (#1 on humility is about that, but also #2 that suggests that we don't know enough about how financial markets operate). Caution here is at the service of an Hippocratic oath suggesting that an intervention carries an obvious risk of harm but a less certain chance of benefit. His rule #4 says that macro-prudential regulations like capital controls "don’t work great. People and institutions find ways around them. In the process of reducing the problem somewhere you tend to create distortions elsewhere." So, first do no harm [no mention of George DeMartino's actual economic oath, by the way], and please don't use capital controls [that's why I remain very skeptical about the IMF's new view on capital controls; for more go here]. The lesson #3 is simply funny; what they didn't know that there are spillover and contagion effects? He is even making the mainstream sound worse than it is [for a more thorough discussion of what the mainstream learned and its limitations go here]. Last but not least there is lesson #5, which suggests that Central Bank Independence (CBI) does not work if the tasks go beyond inflation targeting. Note that he had defended as a change in macro the idea to raise the inflation target from 2% to 4% [seriously!]. Here he tells you that CBI has been "one of the major achievements of the last 20 years." The problem is not with CBI per se, but that with new demands on central banks (why the new demands appeared is an incognita, and he does not think is deregulation, or at least doesn't say so) CBI becomes more difficult. There is no discussion of why CBI has been orthogonal to the so-called Great Moderation, caused by stagnant real wages and globalization. The problem with CBI is that by definition it imposes a rule of not coordinating with the Treasury on fiscal policy, and in some cases the central bank might be forbidden to do basic things like buying government debt (like the ECB). 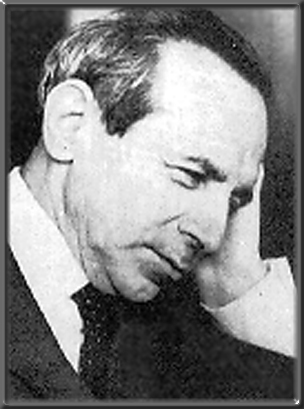 The justification is the fear of inflationary pressures, while the truth might be closer to Kalecki's view that fiscal and monetary policy are used to maintain a significant level of unemployment to keep workers in line. So again it seems that Blanchard has learned nothing from this crisis. Mind you, John Taylor, Martin Feldstein and others are out there calling for higher interest rates. So, all in all, you might think that Blanchard, like Krugman and DeLong, is among the most moderate and reasonable in the mainstream. However, he is at the IMF, an institution that is still pushing fiscal austerity, and his inability (or unwillingness) to learn from the crisis has considerably more impact on economic policies around the world. This column was originally published in Estadao Sao Paulo on March 31st. The answer is that the crisis in Cyprus epitomizes everything that is wrong with the European Union. 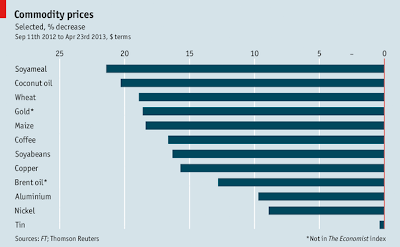 Most fundamentally, there is the very fact that Cyprus was allowed to adopt the euro in 2008. It was already an offshore money-laundering center. Even after problems struck other European countries with oversized banking systems, the EU looked the other way when Cyprus offered high interest rates in order to attract additional hot money. It looked the other way when the banks loaded up on high-yielding Greek debt. The big Cypriot banks all passed the EU’s bank stress tests with flying colors in the summer of 2011, which seems incredible with hindsight. The government had already lost market access, and it was clear that it would require a bailout. It was clear that Greece would restructure its debt and that this would punch a hole in the balance sheets of the banks. In July 2011 the largest power station on the island then blew up, literally, because the government in its wisdom chose that spot to store live ammunition. For all these reasons, the writing was on the wall. But no serious negotiations were undertaken for the next year and a half. Cypriot officials didn’t want to admit their negligence, while the European Commission for its part didn’t want to negotiate with a Communist-led government. When negotiations finally commenced last month following the election of a new Conservative government, they took place under severe pressure of time. But this is no excuse for the ham-handed nature of the package. The Cypriot authorities sought to preserve a broken business model – to hold onto their big Russian deposits by taxing small depositors. They are heavily responsible for the panic that ensued. But nothing forced the European Commission, the ECB and the IMF – the members of the so-called Troika – to agree to a plan that called into question the inviolability of deposit insurance. The IMF had spent years studying the optimal design of deposit insurance. As we speak, the Commission and the ECB are pondering the design of a common deposit insurance scheme as part of their prospective banking union. Now there are doubts about the safety of small deposits not just in Cyprus but in Italy, Spain and throughout the European Union. The euro group and its new head, Dutch finance minister Jeroen Dijsselbloem, deserve special recognition. It is the nature of the euro group that the chairmanship rotates. Unfortunately, it rotated to an inexperienced chairman at the worst possible time. By first asserting and then denying that the Cyprus depositor bail-in was a template for how the EU would manage subsequent crises, Mr. Dijsselbloem created high anxiety about the future and raised the likelihood that more bank runs and crises will follow. The ensuing panic has called into question the very survival of the single currency. To halt depositor flight, Cyprus has been forced to impose capital controls. As any Brazilian knows, once capital controls have been imposed they are very hard to remove. The idea that they will be taken off after a week or a month is fanciful. Those controls make a euro deposit in a Cypriot bank worth less than a euro deposit elsewhere. So much for the principle of a single currency. And so much for the “three freedoms” – free movement of not just goods and people but also capital – that EU membership is supposed to confer. What should have been done instead? EU authorities were right to acknowledge that loaning large amounts of money to the government so it could bail out the banks was no solution, since this would have saddled the sovereign with unsustainable debts. But they were wrong to insist that the government immediately write down bank deposits, even large deposits above €100,000, since doing so meant destroying at a stroke the financial sector that was the Cypriot economy’s most important business. It consigned Cyprus to a depression of historic proportions. Instead, EU leaders should have acknowledged that Cyprus hadn’t gotten into this mess without their help. The EU had looked the other way when Cyprus adopted the euro. It looked the other way when its banks went after Russian money. It even gave those banks its seal of approval. The EU should therefore have used its rescue fund, the European Stability Mechanism, to inject funding directly into the banks, repairing their balance sheets. Over time, the banks could have been downsized. Standards for foreign deposits, from Russia and elsewhere, could have been tightened. The problem could have been solved without bankrupting the country. This approach would have come at some cost to other EU countries. But that cost would have been small, given Cyprus’ small size. And cost sharing would have been fair and just, given the role of the EU in allowing the problem to develop. But this presupposes European politicians willing to make the case to their constituents. It imagines an EU in which decisions are driven by economic common sense and not by Germany’s impending elections. That, of course, would be a very different EU than the one we actually have, in turn raising the question of whether the actual existing EU can survive.